1. This very special rainbow over Tasmania. Seriously, do yourself a favour and visit Tasmania! 3. Australia, touched by angels, Gracetown, WA. 4. The prettiest sky you’ve ever seen, Moolaalaba, Queensland. 5. What about these wonderfully wild skies above Woolloomooloo, NSW? 6. Basically Australia’s skies rock any day of the week. On Australia Day we take it up a gear! Here’s fireworks, lightning AND a comet over Perth, WA!!! 7. Watch out for the Gates of Hell, Ararat, Victoria. 8. And keep your head down during UFO invasions over Manly, NSW. 9. Some days it seems like we’re living in a parallel universe: witness this fallstreak cloud over Gippsland, Victoria. 10. Here’s the Michelin Man on the move over Woodlands, Queensland. 11. And a truly epic shot of daytime night skies during 2012’s total solar eclipse from Ellis Beach, Far North Queensland. 12. Oh, just some camels enjoying the sunset in Broome, Western Australia. 13. Just another EPIC Sunday sunset, Point Lonsdale, Victoria. 14. You better run, you better take cover. Lightning storm over Perth, WA. 15. Feeling hungry? Much on this candy floss cloud spotted over the Mornington Peninsula, Victoria. 16. OMG!!!! The End of the World Has Begun. What a sunset! 17. WUT?! Seriously INSANE skies over Geelong, Victoria. 18. I see your double rainbow and I raise you! Circle rainbow, Cottesloe, WA. 20. 1-2-3 OMG!!! 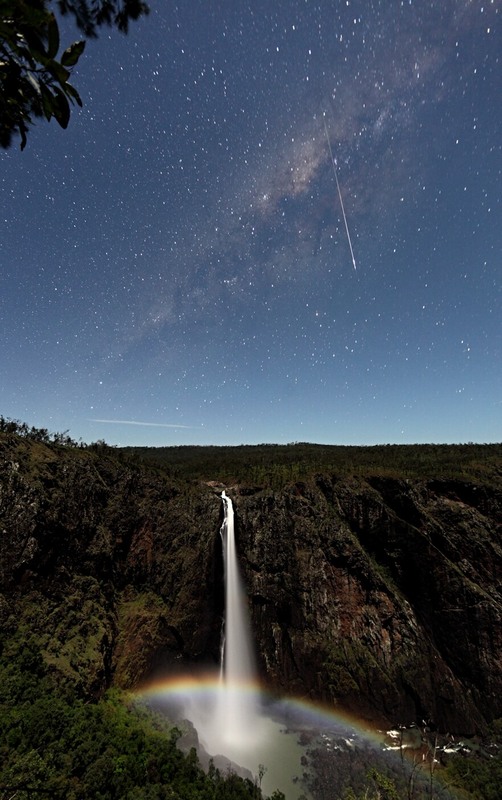 Magnificent meteor, Milky Way AND moonbow over Wallaman Falls, Queensland. 21. What’s the story Morning Glory, Far North Queensland. 23. Fancy a nice afternoon down the beach waiting for a tornado to touch down? At Bellarine Peninsula, Victoria. 24. Oh wait, we call these guys Willy Willys right? Twister menacing Mt Bryan, SA. 25. The Southern lights over Howden, Tasmania? 26. Mercury, Venus and the Moon behind the Australia Telescope Compact Array, Narrabi, New South Wales. Boom, Boom, BOOM!!! 27. But you don’t need a radio telescope to enjoy the Milky Way: do as these dudes do at Greenhead, WA. Moon, clouds, plane almost obscure sun over Fremantle, WA.